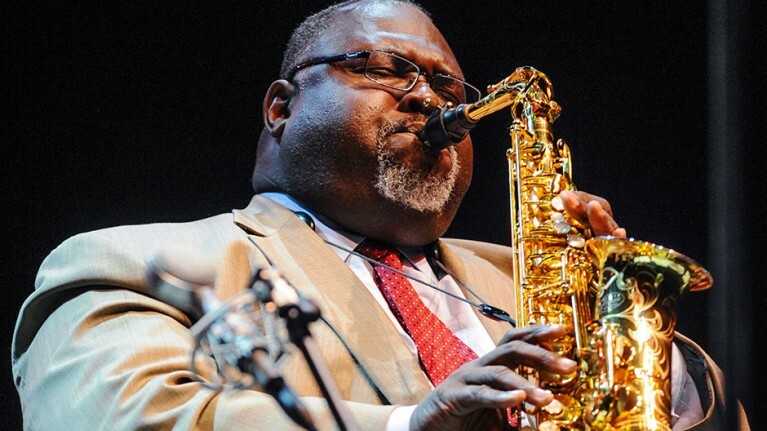 The Alabama born alto saxophonist Sherman Irby has long valued his association with the Jazz at Lincoln Center Orchestra, having served in its illustrious saxophone section first from 1995-1997 and then rejoining it again since 2005 till the present. Irby studied music at Atlanta’s Clark University under the direction of Dr. James Patterson and credits trumpeter Danny Harper as an important mentor. Once out of college and living in Atlanta, Irby landed a gig with piano legend Johnny O’Neal, a valuable learning experience. He worked cruise ships and between his stints at the JALCO landed work in groups led by Latin jazz master Papo Vazquez, pianist Marcus Roberts and played in drumming legend Elvin Jones’ last group. Outside of the JALCO, Irby has created his own career as a leader/collaborator and composer. I interviewed the affable saxophonist in March of 2016 which you can link to here. Back then, the ambitious composer in him was very excited about an opera he was working on based on Dante’s Divine Comedy. While being a member of what is perhaps the most famous big band in the country has its own rewards, when I spoke with him, Irby also was excited by his own working group Momentum, a quintet, which he felt was developing into an intuitive powerhouse. Cerulean Canvas, Irby has finally documented this group and in the process created one of the best contemporary straight-ahead jazz albums of the year. Under the influence of Wynton Marsalis, Irby has become a living proponent of the importance of maintaining the jazz tradition. Irby’s sound is large and full as is the big man’s stature and presence on the bandstand. His tone and attack confirm long and diligent study of some of the great masters that have influenced him. Parker, Stitt, Hodges, McClean, Desmond, Sanborn all have a stake in this man’s playing. Irby has not only mastered the tones and techniques of his elders, he has forged his own distinct voice that is a flawless amalgam of some of the best features of their playing. More than anyone else, Irby evokes the effusive and glorious sound of altoist Cannonball Adderley. Check out his unadulterated swing on the burning opener “Racine.” The complex lead line is a straight-ahead marvel of precision between Irby’s searing alto and Gardner’s slippery trombone. This is a challenging composition by Irby, an offering dedicated to bassist Gerald Canon who hails from Racine, Wisconsin and who Irby features on both the intro and coda. After the probingbass intro, the group bolts like a thoroughbred right from the opening gate in marvelous synchronicity. “Poppa Reed” is an Irby dedication to his pianist, Eric Reed, whose facile touch is featured on this walking blues. The sparse Count Basie-like piano intro is steeped in the tradition and Irby’s solo is warm and liquid with a Johnny Hodges feel to it. Canon is a very lyrical bassist and we get to hear some of his inventiveness midway through this selection on a thoughtful solo. The pianist Mulgrew Miller’s “From Day to Day” is a gorgeous emotional composition played to perfection; my top pick off this album and quite possibly one of the most beautiful pieces of music I have heard all year in both lyricism and execution. Reed’s piano is luscious, and Irby’s tone is impeccably articulated, at times Desmond-esque and yet clearly an invention of his own making. His lines are like woven silk threads in a fine tapestry, vibrant in their color, high in tensile strength and yet delicate and smooth in texture. He is joined here by the trombonist Eliot Mason who shows admirable subtly and fine tone. Drummer Jones and bassist Cannon allow the rhythm to float giving Irby a buoyant platform on which to weave his magic. The hopping “Willie’s Beat aka The Sweet Science” is an Irby tribute to his drummer/cohort Willie Jones III. The song has a nice medium-tempo swing and features Mason on trombone, this time for a more extended solo that is quite enjoyable. Irby again shows how fleet, but never rushed, he can be on his horn, here sounding a little more biting, like Jackie McClean, without ever loosing that swing. Reed does his turn on a nice keyboard feature before drummer Jones is spotlighted with a brief but potent solo. Another favorite on this album is “Contemplation.” No post-bop recording would be complete without at least one of Wayne Shorter’s tune. Here the dual-line of Irby and Mason are featured on this ballad. Mason is the lead voice and he shows great warmth in his approach to this moody piece. Shorter’s music has a way of changing a musician’s approach to his horn and here you can hear it in the altoists’ more careful, studied playing. Irby’s lines are sparse, more thoughtful, deliberately declaratory, less spontaneous. Reed’s tinkling piano notes are spot on. The rest of the album shows some interesting diversity in theme. Taking on a song from the more contemporary pop canon like Stevie Wonder’s “Smile” can be a challenge for a jazz musician, but Irby and company turn it into a walking blues. Trombonist Vincent Gardner returns with one of the more abstract compositions on the album, “Blue Twirl: A Portrait of Sam Gilliam,” dedicated to the African- American painter, Sam Gilliam, but even the abstract can be made to swing in the hands of Irby and company. On his most potent display of his Cerulian Blues credentials, Irby plays (as he says in the liner notes) some “…real barbeque music.” The song, “John Bishop Blues,” a delightful showcase for Mr. Irby to wail on. His tone has the gut-bucket feel of all those blues masters that went before him. He is joined by Wynton Marsalis who offers his own tradition-drenched solo. As if to give some comic relief, Mr. Irby and Mr. Gardner play an up-tempo version of the song made famous by the Harlem Globetrotters, “Sweet Georgia Brown.” Drummer Jones uses just his sticks to keep the beat as Cannon lays down the bass line and the two horns weave along the melody. The closer is a Gerald Cannon tune “SYBAD,” dedicated to the memory of longtime JALCO baritone saxophonist Joe Temperley. Marsalis rejoins the group sans a trombonist. The trumpeter takes the first solo and plays a series of cascading lines including some high register reaches before yielding to Irby’s alto solo which roils just under the surface to begin with. As he gets into it, his lines dart in and out, bobbing and weaving like a boxer shifting his weight and stance to avoid incoming blows. Reed’s thoughtful solo changes the mood and is followed by a return to the head at the coda. 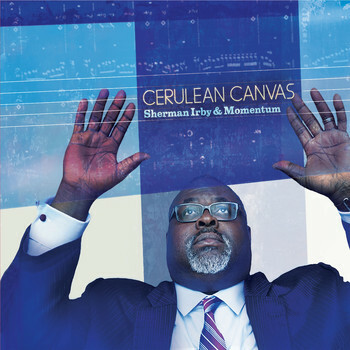 On Cerulean Canvas Momentum paint a series of musical portraits that are always engaging and at times quite beautiful with Sherman Irby clearly establishing himself as one of the finest alto saxophonists of his generation.